The image depicted on this panel is a derivation from Leonardo da Vinci’s famous drawing representing a Head of a woman looking down(Fig. 1), kept in the Gabinetto Disegni e Stampe of the Uffizi in Florence (no. 248 E., 208 x 199 mm). The painter adopted the same half bust framing, the pose towards the left-handside with the head leaning down and the long hair with the elaborate hairstyle of the feminine figure. 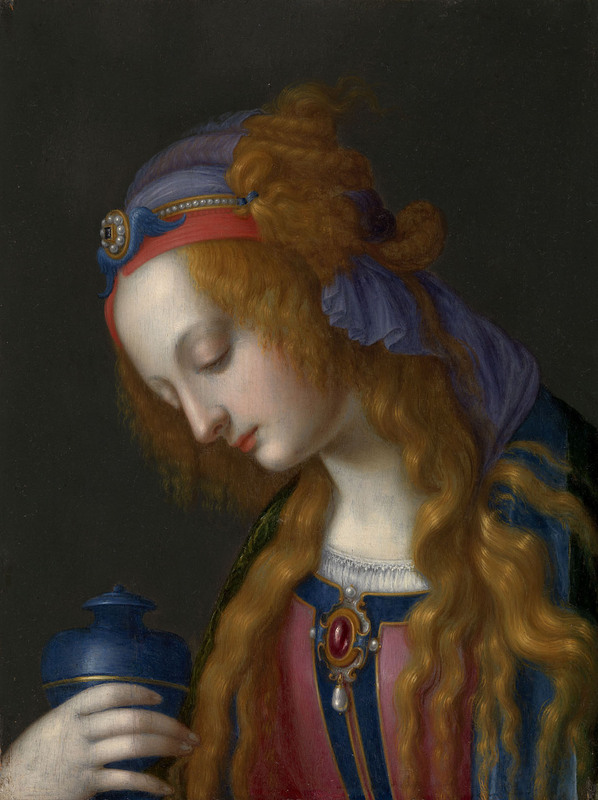 He took the liberty of adding the ointment jar, held in one hand, in order to depict a Mary Magdalene as a Myrrhbearer, in line with a type of portrait widespread in Florence since the 15thcentury. The refined drawing and the variety of bright colours indicate that this panel belongs to the 17thcentury Florentine school. More precisely, in the light of various historical and stylistic elements that will be further discussed, this painting can be attributed to Francesco Bianchi Buonavita. He was the son of a craftsman from Milan, who was an expert in hard stones mosaics and held the position of Director of the work in the Medici Chapels in San Lorenzo and the ducal workshops. Francesco Bianchi Buonavita was apprentice to the painter Giovanni Bilivert (1585-1644) with whom he lived in one of the rooms in the Uffizi. The young artist’s drawings skills were soon noticed by the grand duke Cosimo II de’ Medici himself who took him under his protection and financed a two year long study trip in Rome. The painter then received commissions from prestigious patrons such as Marie de’ Medici, Queen of France, the Duke of Guise, and Michelangelo Buonarroti the Younger. The biographer Filippo Baldinucci dedicated a long chapter to Bianchi Buonavita within the Lifeof his master Giovanni Bilivert.He testifies that the pupil was famous as a copyist and “especially for his works in hard stones”. Until the present panel had been discovered, only two copies by our artist were known. The first one in Santa Maria a Settimello in Calenzano represents the Archangel Raphael with Saint Leonard, Tobias and the patronand derives from Andrea del Sarto’s painting now in the Kunsthistorisches Museum in Vienna. The second one is in the sacristy of the Capuchin church in Palermo and holds the inscription “Francesco Bianchi pittore in Galleria di S.A.S.F. ».It is painted on a small panel (30.3 x 22.5 cm) of very similar dimensions to the present one. The depicted Virgin Maryon this panel derives from the same drawings by Leonardo da Vinci in the Uffizi. This documented painting of the Virginis of the greatest importance in order to attribute the Mary Magdalene with the perfume vessel back to Bianchi Buonavita. It is worth underlining the strong influence of Bilivert in the lines of the face and in the use of a large palette of colours: azure, pink, purple, white and red. Within the catalogue of Francesco Bianchi Buonavita, this work is not closely connected with his paintings on canvas but shows real affinities with his works executed on pietra paesina, a type of painting in which he demonstrated a great talent. If, as I believe it, the Mary Magdalene in penitence painted on slate in the Galleria Palatina in Florence (inv.no. A 1911, n°1138, 26 x 20 cm) can be attributed to Bianchi Buonavita, then the present Magdalene, showing comparable physiognomy and a refined drawing, can also be added to the painter’s catalogue. The mark on the back of the painting allows us to identify it with the Magdalenesold at Christie’s in London on 2ndApril 1954 (lot. 173) with an erroneous, but meaningful, attribution to Giampietrino, an artist strongly influenced by Leonardo. Filippo Baldinucci, Notizie de’professoridel Disegno da Cimabue in qua, Florence, 1681-1728, ed. by Ferdinando Ranalli, Florence, 1845-1847, 5 vol. ; reed. by de Paola Barocchi, Florence, 1974-1975, IV, pp. 311-5. For a reproduction of the drawing, see Alessandro Vezzosi (ed. ), Leonardo e il leonardismo a Napoli e a Roma(exh. cat. Roma-Napoli, 1983), Florence, 1983, p.134, fig. 295. The painting is published in the recent catalogue of the Galleria Palatina with an untenable attribution to Jacopo Ligozzi: Serane Padovani, in Marco Chiarini et Serena Padovani(ed. ),La Galleria Palatina e gli Appartamenti realidi Palazzo Pitti.Catalogo dei dipinti,Florence, 2003, vol. II, p. 231, no. 378.